Moral hazard and risk compensation for hikers. If they had not been toting the device that works like Onstar for hikers, "we would have never attempted this hike," one of them said after the third rescue crew forced them to board their chopper. By buying his mortgages and thus freeing up his capital to solicit even more business, Fannie and Freddie are a big reason Mr. Mozilo has driven [now-defunct sub-prime lender] Countrywide past the Citigroups and the Wells Fargos to the top of the mortgage heap. "If it wasn't for them," he said of Fannie and Freddie, "Wells knows they'd have us." Mechanical clocks, bell towers, and sandglasses provided the world’s first fair and fungible measure of sacrifice. So many of the things we sacrifice for are not fungible, but we can arrange our affairs around the measurement of the sacrifice rather than its results. Merchants and workers alike used the new precision of clock time to prove, brag, and complain about their sacrifices. Even in emergencies, when charity is most likely to spring forth, we need incentives. For example, doctors in emergencies are an interesting exception to the general rule in contract law against officious intermeddlers: if you are a patient who is in no position to consent or decline treatment, a doctor can go ahead and treat you and bill you. An implied-in-law or "quasi" contract has been formed. The same is not true in almost any other case: if that annoying windshield-washing guy starts cleaning your window without your consent, or if the neighbor kid comes along one day and mows your law without permission, you don't legally owe them a thing. I've just read a very compelling theory of the origin of life. This pegs my "that explains so many things!" meter in a very big way. Alkaline vents -- the tame cousins of black smokers -- were common underneath earth's early oceans, but were chemically different than today. They were a chemical engineer's utopia: high temperatures and pressures, iron-sulfur mineral catalysts, a substantial proton gradient (alkaline vent water to soda-water-like ocean) and vast amounts of surface area formed by microbubbles. A new theory posits that Peter Mitchell's revolutionary discovery, proton-gradient manufacture of ATP, "the energy currency of life", was the original energy source of life, and that early evolution from primordial nucleic acids to the common ancestors of archaea, bacteria, and ourselves occurred in these sea-vent microbubbles. A proton gradient across a membrane simply means that one side is more acidic (it contains more naked protons) and the other side is more alkaline (it contains more water molecules missing a proton, called "hydroxyl radicals" hydroxide ions). Because of Mitchell's discovery we now know that all known life uses membranes with proton gradients across them to convert energy into ATP molecules. Wherever the energy comes from -- from light, from carbohydrates stolen from other organisms (i.e. eating food), wherever -- in every living thing it gets converted into a proton gradient that then is tapped to manufacture ATP. In higher animals ATP is made from a proton gradient that is in turn made from "burning" blood sugar with oxygen, and this ATP powers our muscles and brains. In plants ATP is central to photosynthesis: light striking chlorophyll generates a proton gradient, and that proton gradient is used to manufacture ATP, which in turn is used to make sugars and other plant carbohydrates. In all life ATP powers the energy-using chemical reactions needed to make proteins, DNA, and RNA, the complex chemicals of life. (For biochemists reading this, relax, this is a summary: I've necessarily left out a very large number of complex steps, many still not fully understood). The new theory of the origin of life recognizes that proton gradients existed on a massive scale in alkaline vents. The primordial, carbon-dioxide-rich oceans were acidic like Coca-Cola: they contained too many protons. These soda-water oceans were out of balance with the alkaline vent water, which contained water molecules with protons missing (hydroxide ions). Protons streamed across this gradient, with the protons from the soda-water ocean filling up the proton-deficient hydroxide ions to create normal water molecules. This stream of protons was a massive energy source that could be tapped to drive vast numbers of energy-consuming chemical reactions. Large amounts and varieties of chemicals were made on the vast surface areas of the microbubbles, eventually leading to the immensely complex chemicals and reaction pathways (metabolisms) that became life. When, much later, plants evolved, they pulled almost all of the carbon dioxide out of the air and oceans, converting it into hydrocarbons and oxygen. Then animals evolved that could breath the oxygen, "burning" it with carbohydrates from eating the plants. Yet these very different energy sources get converted by plants and animals alike into the same thing -- proton gradients across membranes which are used to make ATP, the energy currency of life. Ironically, we humans by burning fossil fuels are putting a small fraction of this ancient carbon dioxide which plants removed from the air and oceans back into the air, where it not only may be causing a bit of global warming, but is also dissolving back into the oceans and turning them a bit more acidic -- a tiny step back in the direction of the primordial conditions in which carbon dioxide concentrations were vastly higher than our puny modern levels, making the origins of life possible. 1. Water percolated down into newly formed rock under the seafloor, where it reacted with minerals such as olivine, producing a warm alkaline fluid rich in hydrogen, sulphides and other chemicals - a process called serpentinisation. This hot fluid welled up at alkaline hydrothermal vents like those at the Lost City, a vent system discovered near the Mid-Atlantic Ridge in 2000. 2. Unlike today's seas, the early ocean was acidic and rich in dissolved iron. 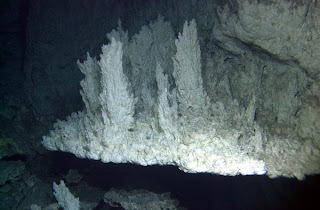 When upwelling hydrothermal fluids reacted with this primordial seawater, they produced carbonate rocks riddled with tiny pores and a "foam" of iron-sulphur bubbles. 3. Inside the iron-sulphur bubbles, hydrogen reacted with carbon dioxide, forming simple organic molecules such as methane, formate and acetate. Some of these reactions were catalysed by the iron-sulphur minerals. Similar iron-sulphur catalysts are still found at the heart of many proteins today. 4. The electrochemical gradient between the alkaline vent fluid and the acidic seawater leads to the spontaneous formation of acetyl phosphate and pyrophospate, which act just like adenosine triphosphate or ATP, the chemical that powers living cells. These molecules drove the formation of amino acids – the building blocks of proteins – and nucleotides, the building blocks for RNA and DNA. 5. Thermal currents and diffusion within the vent pores concentrated larger molecules like nucleotides, driving the formation of RNA and DNA – and providing an ideal setting for their evolution into the world of DNA and proteins. Evolution got under way, with sets of molecules capable of producing more of themselves starting to dominate. 6. Fatty molecules coated the iron-sulphur froth and spontaneously formed cell-like bubbles. Some of these bubbles would have enclosed self-replicating sets of molecules – the first organic cells. The earliest protocells may have been elusive entities, though, often dissolving and reforming as they circulated within the vents. 7. The evolution of an enzyme called pyrophosphatase, which catalyses the production of pyrophosphate, allowed the protocells to extract more energy from the gradient between the alkaline vent fluid and the acidic ocean. This ancient enzyme is still found in many bacteria and archaea, the first two branches on the tree of life. 8. Some protocells started using ATP as well as acetyl phosphate and pyrophosphate. The production of ATP using energy from the electrochemical gradient is perfected with the evolution of the enzyme ATP synthase, found within all life today. 9. Protocells further from the main vent axis, where the natural electrochemical gradient is weaker, started to generate their own gradient by pumping protons across their membranes, using the energy released when carbon dioxide reacts with hydrogen. This reaction yields only a small amount of energy, not enough to make ATP. By repeating the reaction and storing the energy in the form of an electrochemical gradient, however, protocells "saved up" enough energy for ATP production. 10. Once protocells could generate their own electrochemical gradient, they were no longer tied to the vents. Cells left the vents on two separate occasions, with one exodus giving rise to bacteria and the other to archaea. Given the vast complexity of the genes and metabolism that would likely have existed in the common rock-bubble ancestor of archaea and bacteria, I suspect it will be a long time before all but the simplest of these steps are recreated in a lab. Still, this is by far the most compelling theory of the origin of life I've ever seen. Peter Mitchell, discoverer of the proton-gradient manufacture of ATP, was a fascinating character: instead of entering the "publish or perish" and "clique review" rat-race of government-funded science, he dropped out of mainstream scientific culture and set up his own charitable company (nonprofit in U.S. lingo), Glyn Research Ltd. His discoveries were compelling enough to win over the early "he's a wingnut" skeptics and are now the centerpiece of our understanding of biological energetics. My essay "The Trouble With Science" suggests why this kind of independence is good for science. Here's more about Mitchell's theory of proton-powered life called chemiosmosis. The ten-step process above is the theory of William Martin and Michael Russell, and is an extension of Gunter Wachterhauser's iron-sulfur world theory. Often in political parlance the phrase "the market" is used quite broadly to cover a wide variety of voluntary economic institutions, including firms, non-profit organizations, families, and so on in addition to markets proper. But traditional neoclassical economics is about ideal markets proper: instantaneous buying and selling on a costless spot exchange. Ronald Coase started expanding the scope of economics with his work on the firm, and this line of thinking has developed into a school, often called the "new institutional economics" or NIE that focuses on non-market or partial-market voluntary economic institutions as well as on the conditions that must be satisfied for efficient markets to be possible. The economics Nobel committee has finally recognized the study of non-market but voluntary economic institutions with its awards this year to Oliver Williamson and Elinor Ostrom. the origins of money, and more. The new institutional economics school in a nutshell holds that often transaction costs are too high for spot markets to work properly. If spot markets were perfectly efficient we would not need firms or long-term contracts, for example, but in fact we have those and many other institutions besides pure markets. The NIE studies and has started to explain the functions of institutions that are not markets proper, such as long-term contracts and firms, as well as the legal underpinnings of market economies, especially property and contracts. Contracts and property are the main formal expressions of economic relations recognized by the NIE, which makes this school especially interesting to someone like me interested in the economic role of contracts and property and how to adapt these institutions to (and even to some extent incorporate them into) evolving technology. Note that these institutions are "voluntary" in the sense of the traditional common-law principle of non-initiation of force, and assume a sophisticated legal framework. When this assumption doesn't hold, these principles usually work in a very different way or don't work at all, and one has to be very careful applying them. (See here and here for more on the problem of coercive externalities). Meanwhile, here is a good article introducing the other economics Nobel winner this year, Elinor Ostrom. (1) Find the easier thing. If there is an easier way to get much of the value from a proposal, ask yourself, why hasn't somebody pursued this easier way? For example, seasteading proposes the creation of novel structures for people to settle permanentantly in the ocean. Ask yourself, why don't there already exist communities that live permanently on cruise ships? Why haven't oil companies moved the families of their offshore platform workers out to live where the work is? (2) Look to see if if the futurists have proposed experiments that can be done much sooner and more cheaply that would verify or falsify the propsosal or prediction. Many of the "most important", in terms of perceived future impact, hyper-futuristic ideas are conveniently unfalsifiable: artificial intelligence, uploading of consciousness, and so on. There are a near-infinite number of unfalsifiable theories that our imaginations could dream up, making the odds of any given such theory to be true about zero. The ability to conduct such dispositive experiments, the ability to prove a hypothesized event false if certain conditions occur, paradoxically makes that event far more likely. A related heuristic is to be very leery of ideas that, as is said of fusion power, are "always thirty years in the future". If the futurist can't explain why the futurist of 30 years ago who predicted something similar was wrong, that futurist should indeed be laughed at, early and often. Far too many futurists are so futuristic that they know little about the past which they purport to be projecting. Some don't even know when predictions similar to theirs were already made decades ago, and were already supposed to have come true. At the same time, be wary of futurists who are not willing to make short-term predictions, lest we obtain a track record of the vast uncertainty involved in their brand of futurism. (3) Except for rare phenomena of high predictability, such as the orbits of planets, past performance does not guarantee future results. Futurists often chart exponential curves of growth in some measure of technology: the speed of transport, the number of transistors that can fit on a chip, and so on. The first half of a logistics curve looks much like an exponential curve. You can fit an exponential curve to the data points, but it's really a logistic curve, which in the long run, and possibly even in the short run, will lead to a radically different kind of future. Because of physical limits and human psychology, reality far more closely resembles logistic curves than exponential ones. For example, world population growth seemed to follow an exponential curve until about the 1960s, when it flipped into a quite different mathematical regime. This transition to sub-exponential growth started much sooner in the developed world, which should have been but was not a clue for the population alarmists. As for physical limits, a good example is transport speed: it seemed to be growing exponentially until it hit the sound barrier in earth's atmosphere and the implacable nature of earth's gravity well beyond it in the latter half of the twentieth century. More on the dubious nature of exponential projections here. (4) Beware of the prophets of false certainty. These are people who focus on one out of many possible outcomes, or take very seriously unfalsifiable predictions, or follow exponential projections, or have neglected to find the easier thing, and pretend, because nobody has proven them wrong, that their version of the future has a high probability. We have, for example, the Bayesiologists, who, while to their credit are at least aware of first-order uncertainty (known unknowns), neglect the higher-order uncertainties (unknown unknowns) inherent in most futurism and demand that we make some intuitive guess as to the numerical probability of their predicted event. (When asked for an intuitive numerical guess about some hyper-futuristic prediction, "50%, plus or minus 50%, distribution function unknown" is usually the best answer). (5) Look at interests. You may not understand the science involved, but individual and institutional interests are human universals. Take astrobiology, for example. Here we have a science without a subject. Now the astrobiologists to a man argue that extraterrestrial life must be common, indeed that it may well be right around the corner underneath the ice of Enceladus or Europa or on one of those exciting new exoplanets. There appears to be, as many activists like to say about global warming, a "consensus" among the astrobiologists about the ubiquity of life in the universe. But only primitive life, of course -- otherwise the uncomfortable fact that we have never observed the signs of any artificial surfaces, despite observing billions of stars in our own galaxy and billions of other galaxies, would rear its inconvenient head. Thus the Rare Earth Hypothesis, in which for clever reasons life is supposed to almost always stops evolving beyond some primitive stage, in sharp contrast to the ongoing evolution of life to higher complexity in the only history of life we have actually observed. Does the astrobiologists' consensus reflect their expertise and your ignorance in astronomical and biological matters, or does it reflect something else? Consider this -- if you were skeptical about this astrobiological thesis, why would you become an astrobiologist in the first place, risking your career on a science that has no subject? If the politicians and academic boards who fund them ever became convinced that extraterrestrial life probably does not exist anywhere where we will be able to observe it before they retire, astrobiologists would have to find new jobs. This is a career for true believers. Beyond this rather dramatic selection effect, we have individual and institutional self-interest to keep the argument going -- to fund their careers, astrobiologists must persuade us that life in universe is common, common enough that we should fund multibillion dollar telescopes and spacecraft and, of course, grant copious amounts of research funding to them in order to look for it within or astronomically very near our solar system, which is as far as we can observe the signs of primitive life. Even if you know nothing whatsoever about either astronomy or biology, but do understand a thing or to about humans, you are wise to be highly skeptical of the claims of astrobiologists. (6) Be especially skeptical of political futurism. From NASA's Shuttle and Space Station, which were supposed to revolutionize space industry, to the politicization of doom-and-gloom scenarios such as overpopulation and the supposed dire consequences of global warming, politics mixed with futurism has a very poor track record. By contrast, private entities like the Singularity Institute, Foresight Institute, and so forth, while even more outlandish and preposterously self-serious, can provide creative starting points for brainstorming towards more practical ideas and are relatively harmless. (That leads me to my last heuristic -- (7) avoid futurists who can't laugh at themselves). Futurism at its best is a creative and entertaining game of ideas. Playing with outlandish ideas can be very productive -- for example, the Easier Thing on occasion may turn out to actually be a good idea you can implement now, and you arrive at the easier thing by starting with an outlandish idea. I occasionally explore outlandish futuristic ideas here at Unenumerated, which prides itself on an unending variety of topics. There is nothing to sneer at about futurism as fun unless you have an unimaginative rock for a brain. However, those who take these ideas too seriously, or have created a false sense of certainty about them, do deserve a few guffaws. Tax collection is the most efficient department of government. Its efficiency rivals that of many private sector institutions. From the point of view of many taxpayers this is an incredible claim, given that tax collectors take money we ourselves know how to spend quite well, thank you, and often spend it on amazingly wasteful activities. And the rules by which they take it often seem quite arbitrary. Tax rules are usually complex but nevertheless fail to let us account for many events important to the earning of our incomes that differentiate us from other taxpayers. (2) Second, we will explore the problem of creating tax rules, and see how the difficulty of measuring value rears its ugly head. Tax rules solve the value measurement problem through brilliant, often very non-obvious solutions similar to solutions developed in the private and legal sectors. Often (as, for example, with accounting) tax collectors share solutions used to measure value in private relationships (such as the absentee investor-management relationship in joint stock corporations). It is in making these very difficult and unintuitive trade-offs, and then executing them in a series of queries, audits, and collection actions, that tax collectors efficiently optimize their revenue, even if the results seem quite wasteful to the taxpayer. The tax collector's incentives are aligned with the other branches of their government in a task that benefits all associated with the government, namely the collection of their revenue. No organization of any type collects more revenue with fewer expenditures than tax collection agencies. Of course, they have the advantage of coercion, but they must overcome measurement problems that are often the same as other users of accounting systems, such as owners of large companies. It is not surprising, then, that tax collectors have sometimes pioneered value measurement techniques, and often have been the first to bring them into large scale use. Like other kinds of auditors, the tax collector's measurement problem is tougher than it looks. Investment manager Terry Coxon has described it well. Bad measures or inaccurate measurements allow some industries to understate their income, while forcing others to pay taxes on income they haven't really earned. Coxon describes the result: the industries that are hurt tend to shrink. The industries that benefit pay fewer taxes than could be extracted. In both cases, less revenue is generated for the tax man than he might be able to get with better rules. This is an application of the Laffer curve to the fortunes of specific industries. On this curve, developed by the brilliant economist Arthur Laffer, as the tax rate increases, the amount of revenue increases, but at an increasingly slower rate than the tax rate, due to increased avoidance, evasion, and most of all disincentive to engage in the taxed activity. At a certain rate due to these reasons tax revenues are optimized. Hiking the tax rate beyond the Laffer optimum results in lower rather than higher revenues for the government. Ironically, the Laffer curve was used by advocates for lower taxes, even though it is a theory of tax collection optimum to government revenue, not a theory of tax collection optimal to social welfare or individual preference satisfaction. On a larger scale, the Laffer curve may be the most important economic law of political history. Adams uses it to explain the rise and fall of empires. The most successful governments have been implicitly guided by their own incentives – both their short-term desire for revenue and their long-term success against other governments -- to optimize their revenues according to the Laffer Curve. Governments that overburdened their taxpayers, such as the Soviet Union and later Roman Empire, ended up on the dust-heap of history, while governments that collected below the optimum were often conquered by their better-funded neighbors. Democratic governments may maintain high tax revenues over historical time by more peaceful means than conquering underfunded states. They are the first states in history with tax revenues so high relative to external threats that they have the luxury of spending most of the money in non-military areas. Their tax regimes have operated closer to the Laffer optimum than those of most previous kinds of governments. (Alternatively, this luxury may be made possible by the efficiency of nuclear weapons in deterring attack rather than the increased incentives of democracies to optimize to tax collection). When we apply the Laffer curve to examining the relative impact of tax rules on various industries, we conclude that the desire to optimize tax revenues causes tax collectors to want to accurately measure the income or wealth being taxed. Measuring value is crucial to determining the taxpayer's incentives to avoid or evade the tax or opt out of the taxed activity. For their part, taxpayers can and do spoof these measurements in various ways. Most tax shelter schemes, for example, are based on the taxpayer minimizing reported value while optimizing actual, private value. Tax collection involves a measurement game with unaligned incentives, similar to but even more severe than measurement games between owner and employee, investor and management, store and shopper, and plaintiff-defendant (or judge-guilty party). ... look a little closer and you find that an individual incurs costs and expenses in earning a salary. He has to pay for transportation to and from work. He may spend money on clothes he wouldn't otherwise buy and on lunches that would cost less at home. And he may have spent thousands of dollars acquiring the skills and knowledge he uses in this work. Ideal, precise rules for measuring his income would, somehow, take all these and other costs into account. The rules would deduct the cost of commuting (unless he enjoys traveling about town early in the morning and later in the afternoon). They would deduct the cost of the clothes he wouldn't otherwise pay (to the extent it exceeds the cost of the clothes he would buy anyway). They would deduct the difference between the cost of eating lunch at work and the cost of lunch at home (unless he would eat lunch out anyway). And each year these ideal rules would deduct a portion of the cost of his education (unless he didn't learn anything useful in school or had enough fun to offset the cost). [Because there are limits to complexity, and] because tax agents can't read minds, the government gives them arbitrary rules to follow: no deductions are allowed for commuting expenses, for clothing that is suitable for wearing outside of work, for lunches that aren't part of the “business entertainment” or for the cost of acquiring the skills a job requires (although you can deduct the cost of improving your skills). The resulting rules often seem arbitrary, but they are not. They are trade-offs, often non-obvious but brilliant, between the costs of measuring more value with greater accuracy and extra revenue extracted thereby. However, the value measurement problem is hardly unique to tax collection. It is endemic when assessing damages in contract and tort law, and when devising fines punishments in administrative and criminal law. Many private sector rules found in contracts, accounting, and other institutions also have the quality that they use highly non-obvious measures of value that turn out, upon close examination, to be brilliant solutions to seemingly intractable problems of mind-reading and the unacceptable complexity of covering all cases or contingencies. Such measurement problems occur in every kind of economic system or relationship. The best solutions civilization has developed to solve them are in most institutions brilliant but highly imperfect. There is vast room for improvement, but failed large-scale experiments in attempts to improve these measures can be devastating. The Laffer curve and measurement costs can also be used to analyze the relative benefits of various tax collection schemes to government. Prior to the industrial revolution, for example, the income tax was infeasible. Most taxes were on the prices of commodities sold, or on various ad-hoc measures of wealth such as the frontage of one's house. (This measurement game resulted in the very tall and deep but narrow houses that can still be found in some European cities such as Amsterdam. The stairs are so narrow that even normal furniture has to be hauled up to the upper story and then through a window with a small crane, itself a common feature on these houses). Taxes distorted the economy of the Netherlands -- quite literally. Here are some houses in Amsterdam built in the 17th and 18th centuries, and a typical narrow staircase. Furniture and other large objects must be hauled up by the small cranes seen above the top-story windows. Prior to the industrial revolution, incomes were often a very private matter. However, starting in England in the early nineteenth century, large firms grew to an increasing proportion of the economy. Broadly speaking, large firms and joint-stock companies were made possible by two phases of accounting advances. The first phase, double-entry bookkeeping, was developed for the trading banks and "super companies" of early fourteenth century Italy. The second phase were accounting and reporting techniques developed for the larger joint stock companies of the Netherlands and England, starting with the India companies in the seventeenth century. Accounting allowed manager-owners to keep track of employees and (in the second phase) for non-management owners to keep track of managers. These accounting techniques, along with the rise of literacy and numeracy among the workers, provided a new way for tax collectors to measure value. Once these larger companies came to handle a sufficient fraction of an jurisdiction's value of transactions, it was rational for governments to take advantage of their measurement techniques, and they did so -- the result being the most lucrative tax scheme ever, the income tax. When does citizen's arrest become battery? Here's a rough citizen's arrest caught on film. Plenty of action during the "more than 7-8 minutes" between when the photographer started shooting and the on-duty police arrived, despite a police station reportedly 2 blocks away. Some interesting comments from locals (apparently most of them police officers) here. Although freelance photographer Mike Anzaldi was there and I wasn't, I'm not completely without doubt about his claim that all the blows administered by the Asian fellow (including a kick to the stomach not pictured here) were justified to "calm him down". You can see some of the ambiguity between controlling a resisting arrestee and battery. (For more of the story, hear Anzaldi's commentary and see more pictures at the first link above). My kudos to Anzaldi for his great documentation of this event. Not so much to the (presumably, since anonymous) cop bloggers with bad attitudes at the second link above, although they do raise one interesting issue, that the victim here did not end up pressing charges -- as a result, the alleged purse-snatcher was only charged with a misdemeanor. Victims often lack an incentive to press charges, and police often try to motivate victims to press charges by withholding stolen property they have recovered. If victims won't act out of a public spirit, or at least out of revenge, to help punish criminals, how can criminals be incapacitated and deterred? By contrast the volunteer citizen arrestors here seem to be acting in a public or at least gallant spirit. I'm not going to take it on faith, as the anonymous bloggers apparently do, that the police have great incentives here either, rather that this does seem to raise a public goods issue, to which police forces are a very imperfect, and in this case quite belated, solution. (AFAIK, BTW, no charges have been filed against any of the arrestors in this case, and I doubt any will be -- they seem to be near but not over the line in using reasonable force to control a resisting arrestee, and even if they were a bit over the line police sympathize with their situation and would be loathe to arrest, and even if arrested and prosecuted a jury would probably let them off). Incidentally, if it had been police officers making the arrest here, those bites would probably constitute battery on a police officer. But there seems to be no analogous protection for citizens making an arrest -- we should consider adding such protection where the arrest is legitimate. (Often, BTW, the burden of proof on citizen arrest is much higher than for police -- in many states the arrestor must have actually seen the crime being committed, a greater burden than the typical police officer's burden of probable cause. I am skeptical of this discrepancy, too). I previously posted on another case with a video showing a store owner shooting a robber, the first time in proper self-defense (or defense of others) under a castle law, but the second time apparently over the line between such proper force and murder.